Greek Yoghurt is a high protein, low fat food, but it can get pretty dull eating it on its own. Here’s a couple of simple recipes that take about 5 mins to whip up and will breath life into this great ingredient. I’m a huge fan of having greek yoghurt in nutrition plans. So much so that, unless a client has a real aversion to it, I try to incorporate it in as many meal plans as possible. The protein content of Greek yoghurt is almost entirely slow release, making it the perfect food choice just before you go to bed. The macros are awesome. My favourite brand has a breakdown of 10g Protein, 4g Carb, and 0g Fat per 100g. Anyone can work that into diet! Having the slow release protein last think at night before you go to bed is the perfect recipe for feeding your muscles and getting maximum recovery while you’re in the land of nod and dreaming of dumbbells and that deadlift PB. I love mixing in an extra scoop of protein powder, throwing in a handful of sultanas, a swirl of honey, and maybe a cheeky Oreo cookie or two if the macros allow. And if I’ve saved up the calories a couple of scoops of Ben & Jerry’s chocolate brownie ice cream hit the spot just right after a hard leg day at the weekend. And Greek Yoghurt is not only good for a late night protein hit, it can be used at any point throughout the day. Throw in some granola and a dollop of honey and you’ve got an awesome breakfast. Or how about mixing it with some chicken and bacon and spreading it on a warm toasted panini for delicious lunch? The list of recipes is endless. You just need to put the mind to work and get creative. The recipes I’ve got for you today are designed to be really simple to make and add a big hit of flavour to keep you coming back for more. Core the apple with an apple corer, or go straight to slicing the apple and then cut out the middle. Layer the apple slices onto two plates and top with the yogurt. Heat a dry frying pan and roast the pecans until golden, then sprinkle over the yogurt. 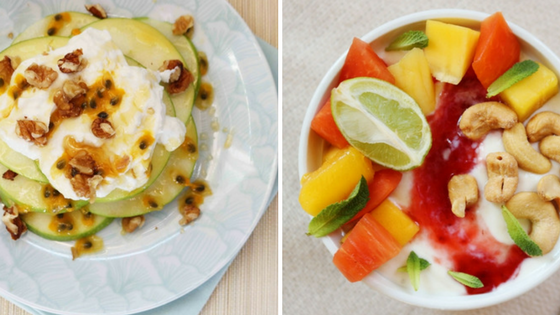 Spoon the passion fruit over the top and drizzle with honey. Divide the yogurt between 2 bowls. Dilute the jam with 1 tsp. of water and then spoon it to each bowl stirring gently to form a ‘swirl’. Divide the fruit and cashews between the 2 bowls and serve garnished with mint leaves and lime wedges. There you have it. Protein packed, macro friendly recipes that will get you falling in love with this great ingredient (if you’re not already). I highly recommend you play about with the ingredient choices so that everything fits you specific macro requirements. So whether it’s a high protein, low carb evening snack you’re after, or a balanced protein and carb preworkout meal, give greek yoghurt a shot. Its versatility is amazing! So, make the effort to plan you meals ahead of time and get in the kitchen to try these new dishes.